Somerset County was first settled by the Dutch and was set off from Middlesex County as a separate County in 1688. Log Church erected about 1700, replaced in 1749 by wooden structure destroyed in 1839. Site of White's or Veal's Tavern where General Charles Lee was captured by the British December 13, 1776. Old oak at Basking Ridge said to have been over two hundred years old. 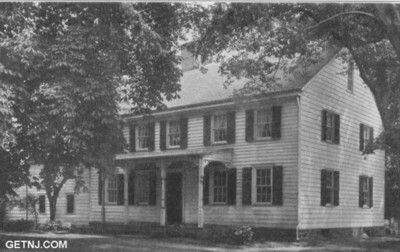 One mile southeast of Basking Ridge stood "the Buildings," the house erected in 1761 by Lord Stirling, a Major General in the Continental Army during the Revolution and subsequently the scene of many social events. A part of the original house is incorporated in the present structure. Six miles northwest of Somerville. Site of encampment of part of the American Army during the winter of 1778-9. The village was raided by the British in December, 1776. St. Paul's Church was used as a temporary prison for two hundred and thirty British soldiers taken prisoners, at Battle of Princeton. 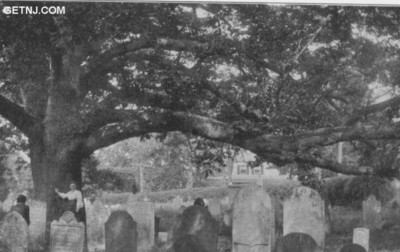 In the village graveyard is buried Captain William Leslie, son of the Earl of Leven, killed January 3, 1777, at Princeton. His monument was erected by Dr. Benjamin Rush of Philadelphia. McDowell House between Pluckemin and Lamington. Site of McCrea homestead, located near McDowell home. Home of the Rev. James McCrea, father of Jane McCrea. Of Revolutionary or post-Revolutionary origin. At the out-break of the Revolution, a tavern stood on the site of The Somerville House. Millstone was the County Seat and when the Court House there was burned by the British October, 1779, the County Seat was removed to Somerville, then called Raritan, about 1784. A Court House and jail built of logs was constructed. The place continued to be known as Raritan until 1809-10. The Church of Raritan was organized March, 1690. The church was burned in 1779 by the British under Colonel Simcoe, and was subsequently rebuilt in combination with the Court House, the congregation contributing one-half of the total cost, and the County paying the balance. The first Somerset County Court House was erected at Six Mile Run, now Franklin Park. The site was marked November 15, 1910, by a boulder placed by the Historical Society of Somerset County, bearing a bronze tablet furnished by the Society of Colonial Wars in the State of New Jersey. It is placed upon the southeast corner of the lot facing the road from Franklin Park to New Brunswick. Somerville was the home of Frederick Frelinghuysen, a member of the Continental Congress at the age of twenty-two, who saw service at Trenton and Monmouth, and subsequently became United States Senator. Wallace House. Washington's Headquarters for six months during the winter and spring of 1778-9, now owned by Revolutionary Memorial Society of New Jersey and used as a museum. Memorial fountain erected by Frelinghuysen Chapter, D.A.R. House of Dirk Middaugh, west of Wallace House, built 1681. Coejeman's House. Built 1737, said to have been occupied by Lafayette during Washington's stay at the Wallace House. Site of old Fritt's Tavern. Was Hotel Somerset. Main Street, corner of Grove Street. First Dutch Reformed Church of Raritan, north side of Main Street between Bridge and Grove Streets. House of Rev. John Frelinghuysen built of Holland brick, 1751, by congregation of First Reformed Dutch Church and known as "Old Dutch Parsonage and First Theological Seminary." It has been removed several hundred feet from its original site. Four boulders with bronze tablets marking sections of Washington's Line of March from Princeton to Morristown, erected by Frelinghuysen Chapter, D.A.R., one at entrance to Somerville, at the corner of Warren Street and Court House Grounds, one at Allen's Tavern, one at entrance to Pluckemin on grounds of Kenilworth Inn, and one at Griggstown. Site of home of Lord Neill Campbell, son of the Duke of Argyle, sometime Governor of New Jersey, located on Raritan River, three miles west of Somerville. The Frelinghuysen Mansion is located on the south side of the road on the outskirts of Millstone. 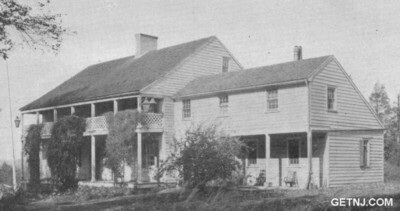 Two miles southwest of Somerville on Old York Road, mansion once owned by Ferdinand Van der Veer, the old home of William Paterson, a Justice of the Supreme Court of New Jersey, Governor of New Jersey 1790, member of the Constitutional Convention of the United States and Justice of the Supreme Court of the United States, for whom the City of Paterson was named. The second Somerset County Court House was at Millstone. On October 28, 1911, the Society of Colonial Wars in the State of New Jersey, the Sons of the Revolution and the Somerset County Historical Society erected a bronze tablet on the site to commemorate this building. In the town of Finderne, about three miles from the Wallace House, is the Van Veghten House, which was occupied by General Greene and his staff during the winter of 1778-9. Supposed to have been originally called Boundary Brook. Settled about 1700. Americans defeated at Bound Brook 1777 by British, under Cornwallis. Site of engagement marked by boulder, at east end of Main Street, bearing bronze tablet commemorating the Battle of Bound Brook, April 13, 1777, between General Lincoln and the British Troops. Staats or Latourette House. Headquarters of Baron Steuben while Continental Army was at Camp Middlebrook. On road from Bound Brook to Somerville, Van Horne House. West of the Middlebrook, north of the highway from Bound Brook to Somerville, home of Philip Van Horne, a Judge of the Common Pleas of Somerset County in pre-Revolutionary days. In winter of 1778-9, occupied by Lord Stirling as his headquarters. Site of the encampment of Washington and his army from May 28 to June 14, 1778. The first camp was in Washington's Valley about one mile from Martinsville, three miles from Bound Brook. Three earth forts were erected guarding the Valley, one of which still exists in a good state of preservation. The second encampment at Middlebrook was from November 28, 1778, to June 3, 1779. The site of the encampment has now been taken over by the Borough to be maintained as a public park. Fourteen miles from Somerville, four miles from Princeton, mansion built 1734 by judge John Berrien, appointed judge of Somerset County 1739 and Justice of the Supreme Court 1764. Washington's headquarters from August 24 to November 10, 1783. Here he wrote his farewell address to the Army. Rocky Hill has been furnished by dif- ferent Societies and contains a collection of most interesting relics. Tablet marking route of Washington to Morristown.